Ian has taken up cycling again, Dutch style. He can ride Kees’ Sparta, a one speed upright with chain guard. He glides around without a helmet looking like a Dutch man. A beautiful sunny day. After an outdoor breakfast we set off on the bikes to go to Utrecht, the nearest city to Driebergen, about 15 km away. Kees predicted that it would be very quiet on a Sunday but Wieteke said it was such a beautiful city and we should go anyway. On the way we passed the very place where Graham’s wheel rims failed in 2000! We visited the Remonstrant Church and received a spontaneous guided tour. In the middle of town there are canals, cafes, shops, people and bicycles everywhere. The Dom of Utrecht is a famous landmark, many centuries old. We climbed to the top (465 steps) with a guided party – great views in all directions. 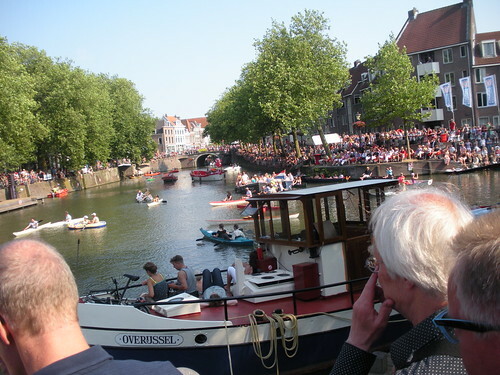 Rather than being quiet, it was a cultural Sunday in Utrecht, with a series of outdoor performances along the main canal during the afternoon. We heard a fine orchestra playing in a boat on the canal, then a choir and youth ensemble. The afternoon culminated with a performance of Handel’s Water Music on a canal-side platform with hundreds of people on all sides, in boats and kayaks. This entry was posted on 5 July 2010 at 6:19 am and is filed under Netherlands. You can follow any responses to this entry through the RSS 2.0 feed. You can leave a response, or trackback from your own site.